Another day, another stunning Malware – this time targeting banks, payment card processors, and other financial services. Security researchers have uncovered a sophisticated payment card malware that executes before the operating system boots, making the malware very difficult to detect and much less remove. The malware in question is part of “Nemesis” – a malware suite that includes all software programs for capturing screens, transferring files, injecting processes, logging keystrokes, and carrying out other malicious activities on the infected computers. Nemesis malware family has been seen in the past, targeting banks, ATMs, financial transaction processing, credit unions, and financial business service companies. The malware with bootkit functionality has been in operation since early this year and has the ability to modify the legitimate VBR (Volume Boot Record) that makes the malware possible to load before Windows starts. This makes the malicious threat hard to detect and remove using traditional security approaches. Moreover, the malware resides in a low-level portion of a hard drive. This makes the malware infection reappears even after the complete reinstallation of the Windows operating system. “The malware that persists outside of the operating system (OS) requires a different approach to detection and eradication,” security analysts from FireEye wrote in a blog post published Monday. Early this year, the cyber criminals tweaked Nemesis to include a utility calledBOOTRASH that has the ability to modify an infected computer’s boot process. In a normal boot, any Windows PC reads data from a hard drive’s MBR (Master Boot Record) that loads the VBR – a piece of code specific to an operating system containing instructions for the OS to begin the boot process. Since BOOTRASH is loaded outside of the machine’s OS, it is not subject to any kind of integrity checks, nor are any of its components scanned by system’s Anti-Virus program, which helps the malware evade detection. According to the researchers, versions of BOOTRASH are targeting both 32-bit and 64-bit Windows architectures. Moreover, due to this newly added Bootkit component, reinstalling the OS will not remove the Nemesis malware. FireEye researchers believe the Nemesis bootkit malware belongs to a financial crime group of hackers, likely based in Russia, called FIN1. The researchers believe that the FIN1 hacking group used this malware, most of the times, to access victims environment and steal cardholders data. In the past, the researchers came across different versions of the Nemesis family when they analyzed FIN1’s malware. How to Protect Your Systems From Nemesis Bootkit Malware? Re-installing the operating system of your Windows machine is not a sufficient method to get rid of this malware. The solution against this malware threat is to use software tools that can access and scan raw disks at scale for evidence of Bootkits, or physically wipe the disks before reinstalling the operating system. “System administrators should perform a complete physical wipe of any systems compromised with a bootkit and then reload the operating system,” FireEye researchers recommend. 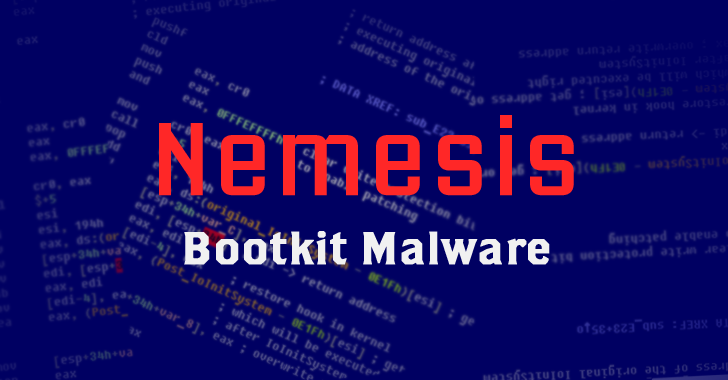 Nemesis is by no means the first malware family to hijack normal boot process of a PC in an effort to gain persistence and stealth, but it is not the first malware family that contains bootkit functionality. In the past, researchers detected malicious threats such as TDL4 (Olmarik), Rovnix,Necurs, and Carberp. Among these, Carberp banking trojan targeted financial institutions.